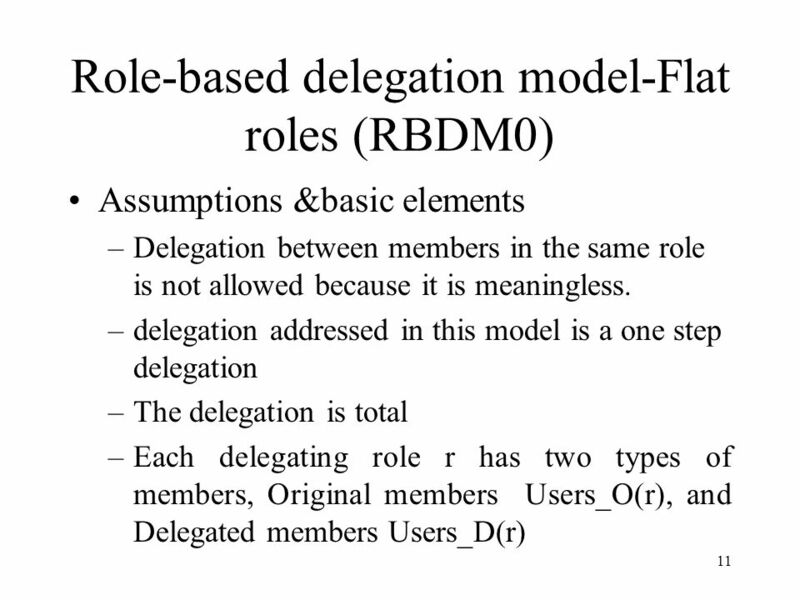 A Role-Based Delegation Model and some extensions By: Ezedin S.Barka Ravi Sandhu George Mason University. 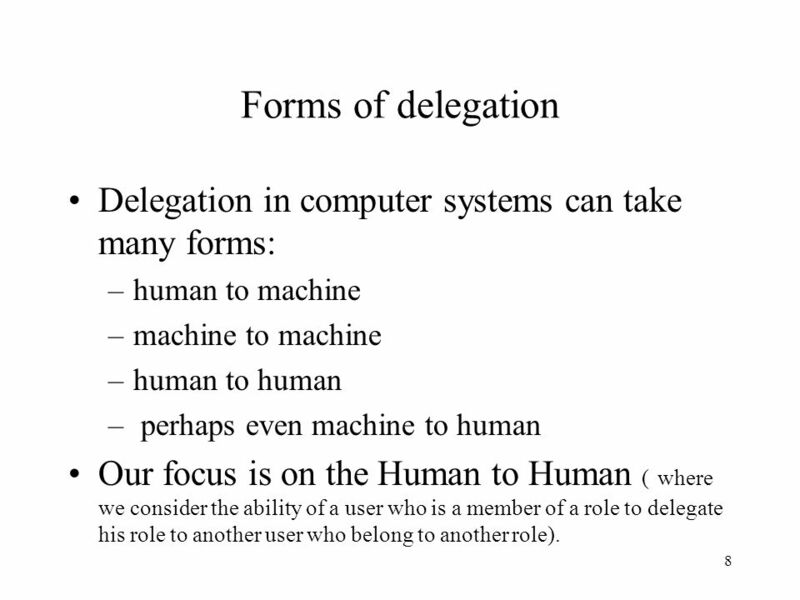 3 8 Forms of delegation Delegation in computer systems can take many forms: –human to machine –machine to machine –human to human – perhaps even machine to human Our focus is on the Human to Human ( where we consider the ability of a user who is a member of a role to delegate his role to another user who belong to another role). 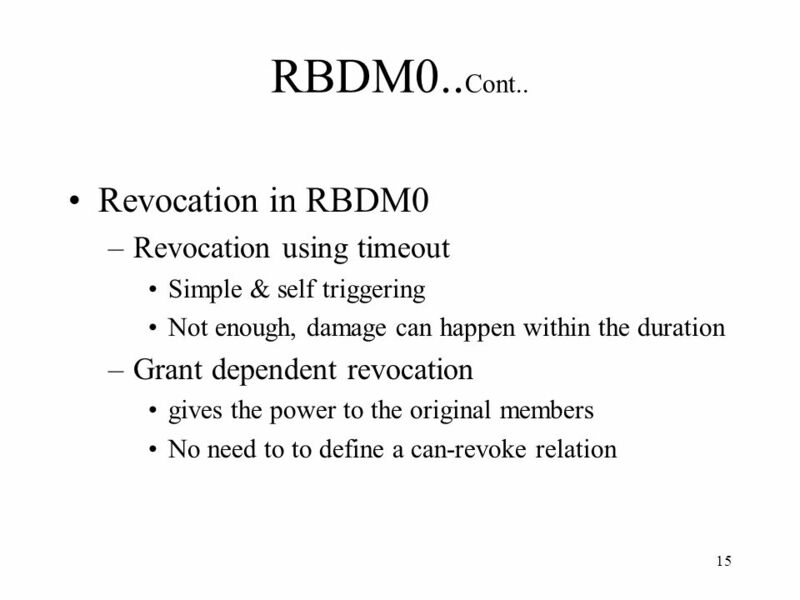 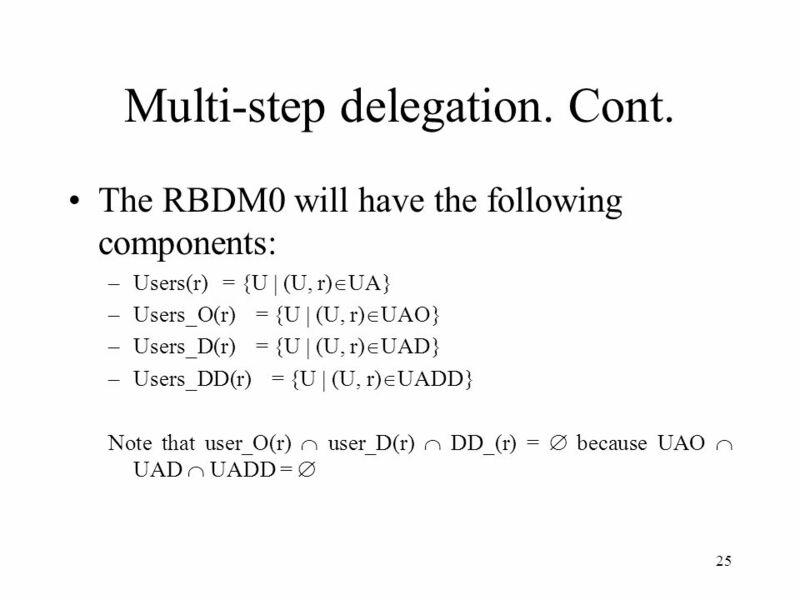 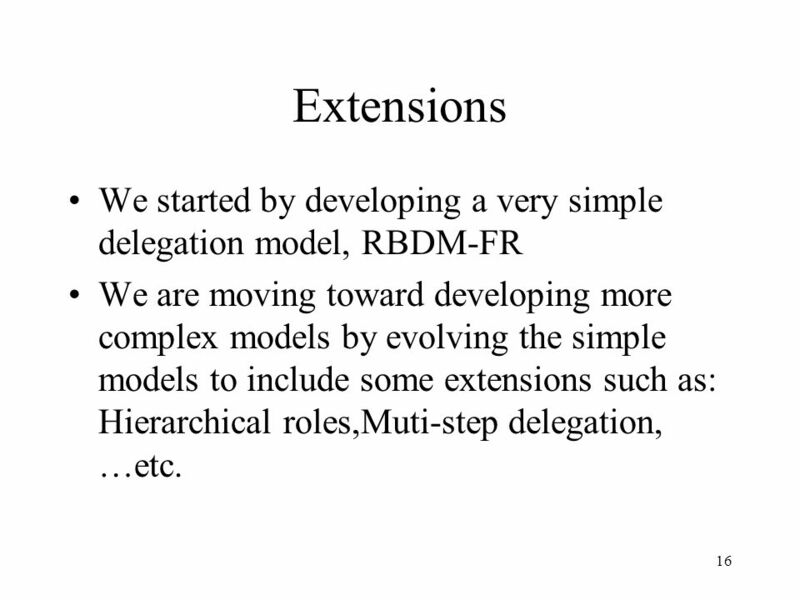 11 16 Extensions We started by developing a very simple delegation model, RBDM-FR We are moving toward developing more complex models by evolving the simple models to include some extensions such as: Hierarchical roles,Muti-step delegation, …etc. 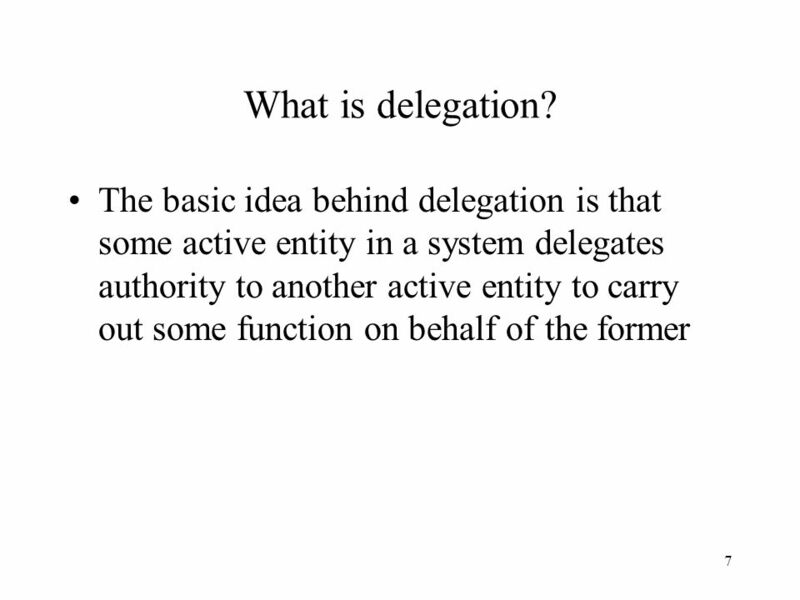 21 26 Types of Permissions (delegable and non-delegable) –Will not have any impact on the delegation or revocation, because the only relevant element to delegation and revocation is the human –It adds an extra control on what can and can not be delegated. 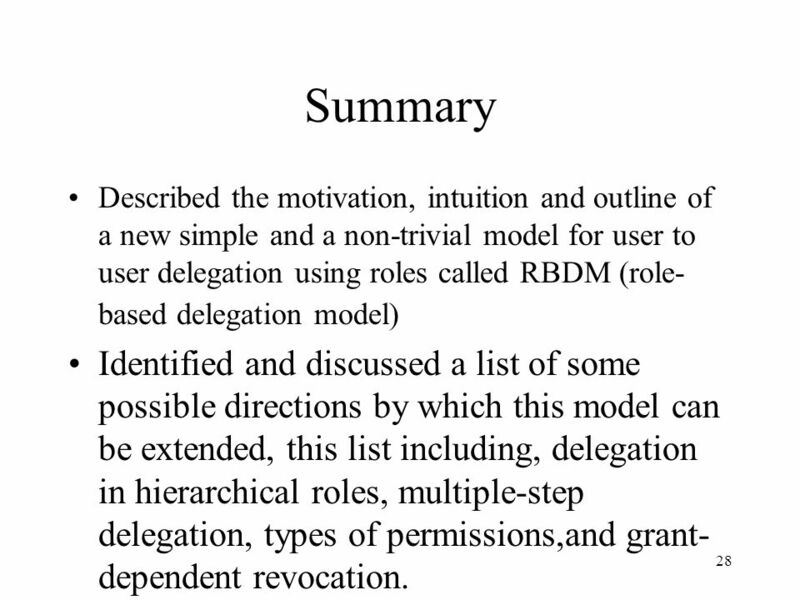 23 28 Summary Described the motivation, intuition and outline of a new simple and a non-trivial model for user to user delegation using roles called RBDM (role- based delegation model) Identified and discussed a list of some possible directions by which this model can be extended, this list including, delegation in hierarchical roles, multiple-step delegation, types of permissions,and grant- dependent revocation. 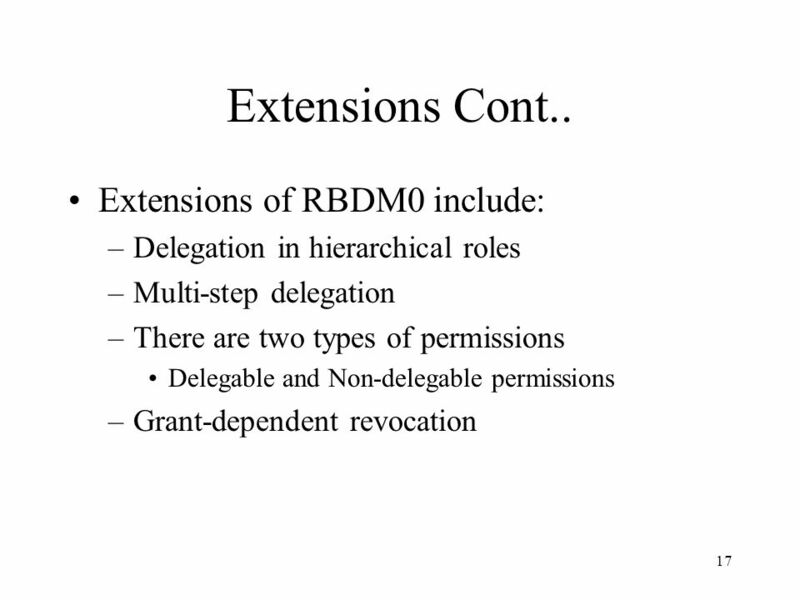 Download ppt "A Role-Based Delegation Model and some extensions By: Ezedin S.Barka Ravi Sandhu George Mason University." 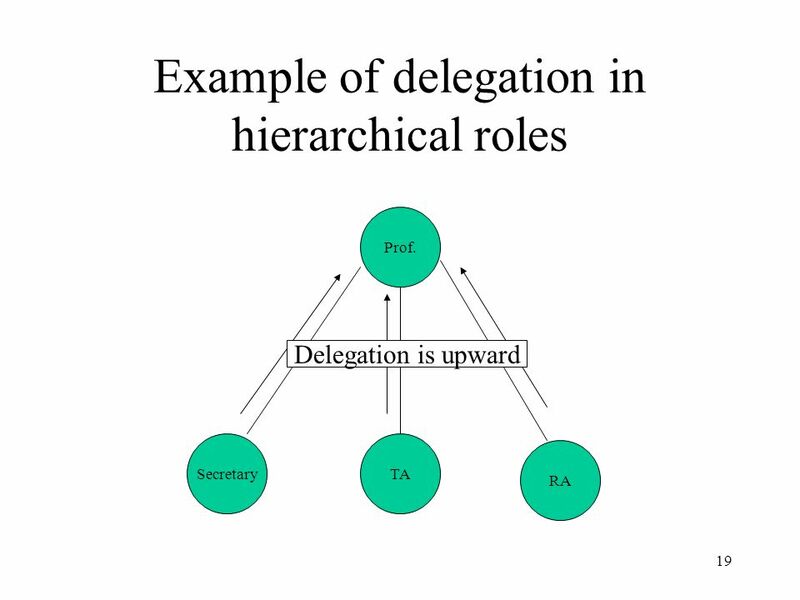 FRAMEWORK FOR AGENT-BASED ROLE DELEGATION Presentation by: Ezedin S. Barka UAE University. 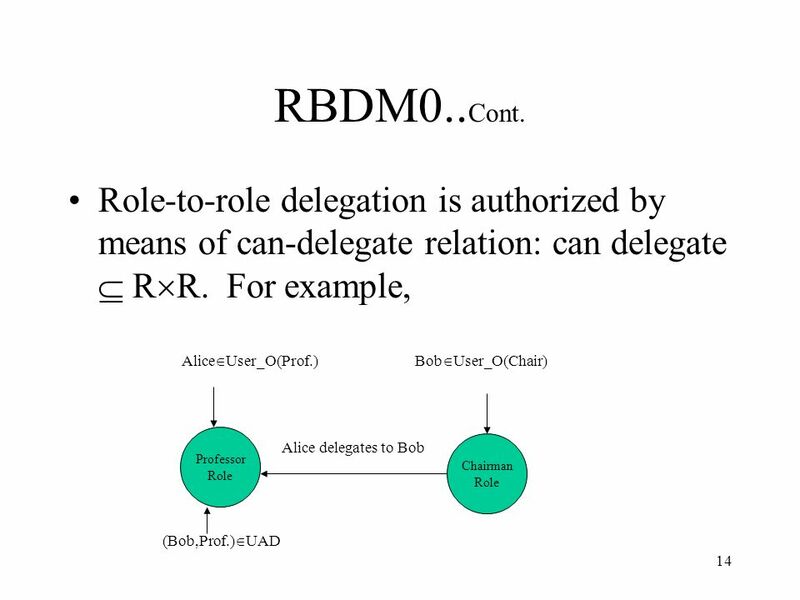 Future Directions in Role-Based Access Control Models Ravi Sandhu Co-Founder and Chief Scientist SingleSignOn.Net & Professor of Information Technology. 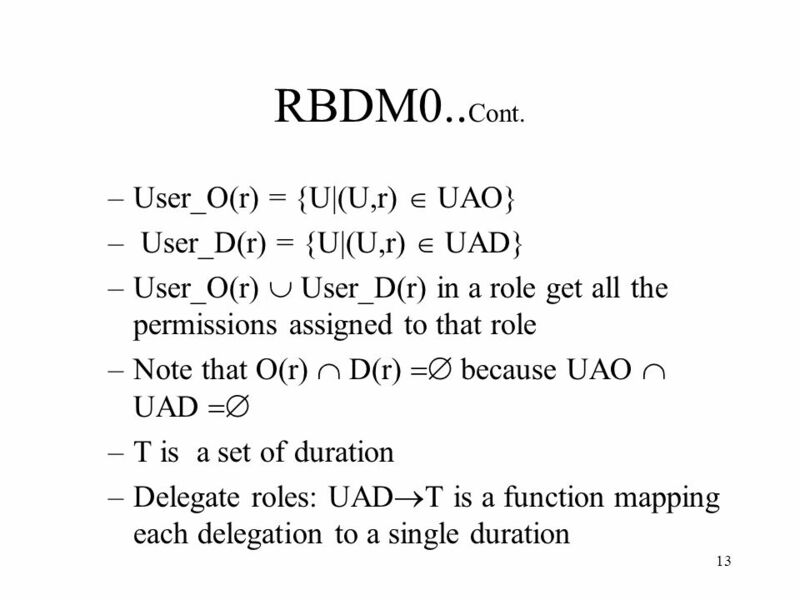 A Logic Specification for Usage Control Xinwen Zhang, Jaehong Park Francesco Parisi-Presicce, Ravi Sandhu George Mason University SACMAT 2004. 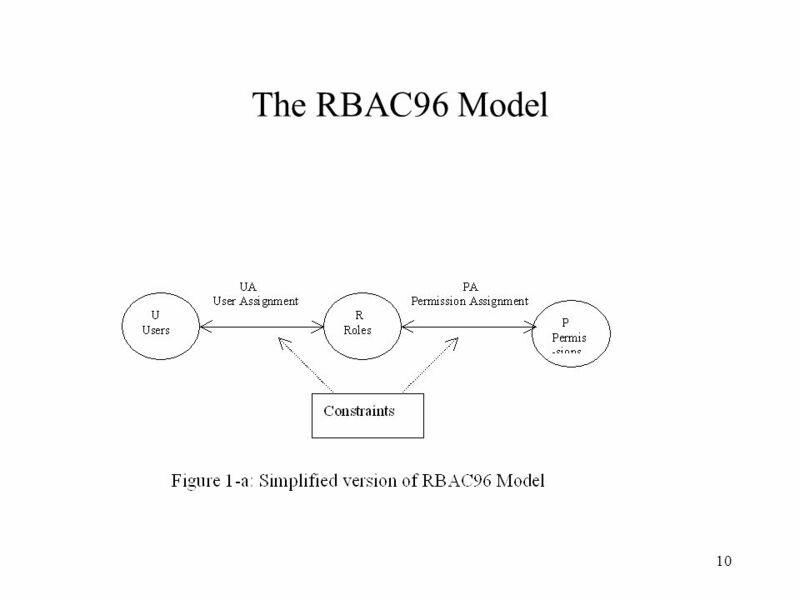 ISA 662 RBAC-MAC-DAC Prof. Ravi Sandhu. 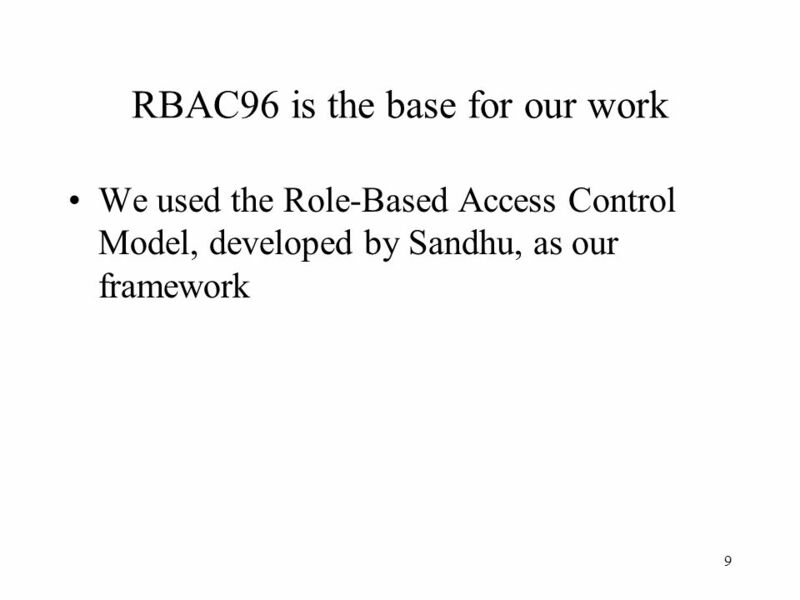 2 © Ravi Sandhu RBAC96 ROLES USER-ROLE ASSIGNMENT PERMISSIONS-ROLE ASSIGNMENT USERSPERMISSIONS... 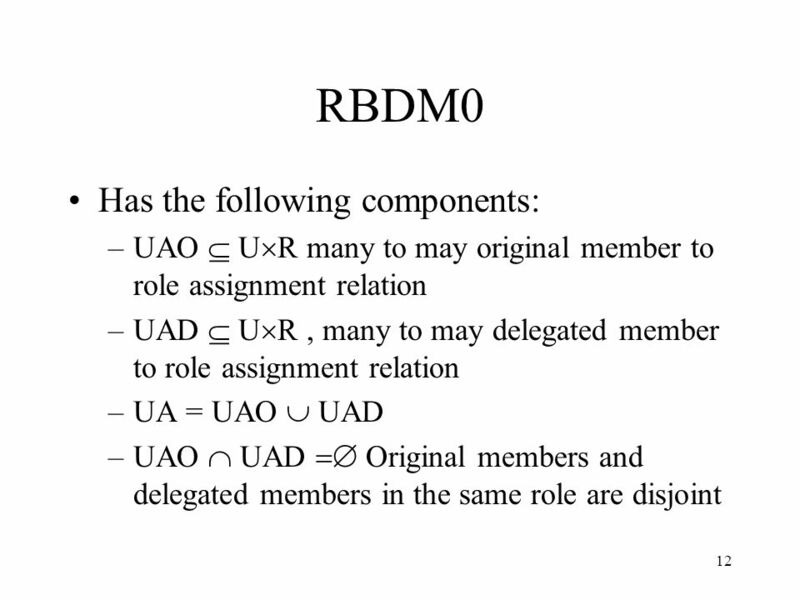 SESSIONS ROLE. 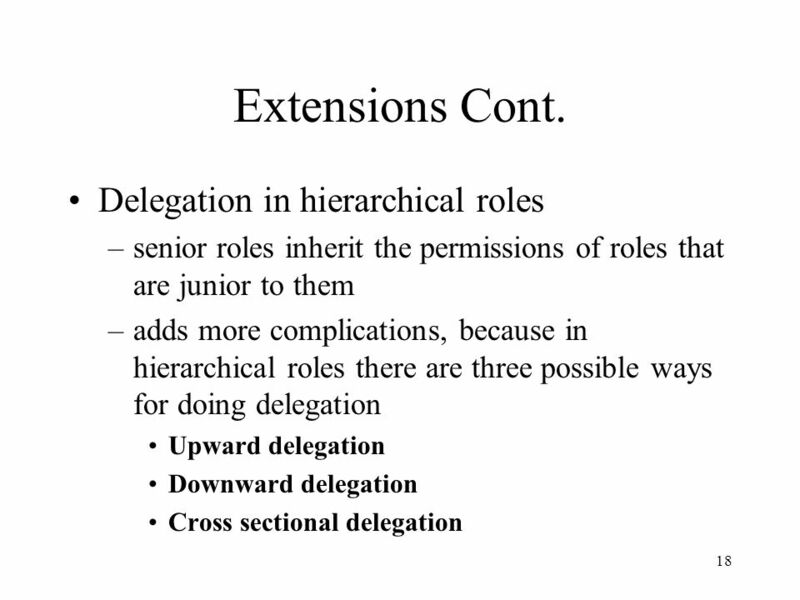 © 2005 Ravi Sandhu Access Control Hierarchies (best viewed in slide show mode) Ravi Sandhu Laboratory for Information Security Technology.